In case it wasn’t already clear, I’m a big fan of cookbooks. Nigel Slater, Edd Kimber, Dan Lepard, The Great British Bake-Off, Tom and Henry Herbert (aka The Fabulous Baker Brothers); all these and more line my bookshelves. I love the satisfying weight of cookbooks, the well-thumbed pages and the way they fall open at my favourite and most-frequently read recipes. I like scanning through the index, looking for something new to try. I love reading the author’s notes that accompany recipes, the personal touches that make them interesting and individual. I love being inspired by a good recipe. As a baker, I tend to apply this practice more towards cakes and sweet things; I love playing around with flavour combinations, fillings, textures. This has been a theme in my recent baking in particular, as I’ve been experimenting with the basic idea of sponge cake. Orange cake with orange cream, vanilla cake with chocolate and chestnut cream, wholewheat banana and walnut cake; these are just a few ideas I’ve been trying and testing. I’m aware that this is very similar to the apple and cinnamon streusel cake that I wrote about a few weeks ago, but that was partially the idea. The flavour combination of sharp apple, warm cinnamon, wholemeal flour and deep, sugary maple syrup is a winning one and one which is perfect as the days grow colder. The difference with this cake is that I reserved the apples for the top of the cake, rather than incorporating them into the batter itself; this made for a slightly drier crumb, but added another textural element in the soft, slightly caramelised fruit that adorned the cake. A maple syrup glaze, brushed on top while the cake was still warm, gave a depth and sweetness that added to the autumnal feel, a perfect complement to the brown sugar in the sponge. 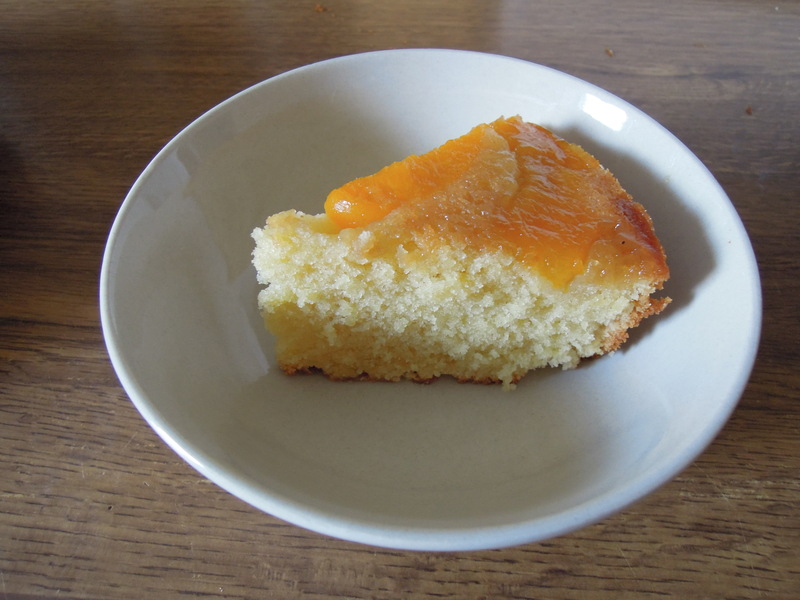 This is a lovely afternoon tea sort of cake, full of warm flavours and very comforting to eat. Exactly right for a cold winter’s day! Thank goodness that it’s nearly the Easter holiday. It’s strange to think that this term began way back in January. It’s been a busy ten weeks and the exhaustion that has been held at bay for so long is finally beginning to break through; only the prospect of an early night and copious amounts of tea and coffee can keep me awake during the daytime, when my eyelids are heavy with fatigue and my brain is fuzzy with tiredness. Putting the thought of a break from work aside, I’m also looking forward to the holiday for another reason. I’ll be spending a few days in London next week and during that time, I’m going to be visiting the Le Cordon Bleu school! They offer a Patisserie Diploma course which I’m hoping to apply for in the (very) near future, so to actually be able to go and see the school is a hugely exciting prospect. (They even have a herb garden on the roof!) Of course, it’s also a little bit scary, because it signals the beginning of the realisation of all my ambitions. This is the next step for me, if I really want to become a professional pastry chef/cake decorator. From this point onwards, it stops being just a dream and starts becoming a reality. This is where everything starts. Now, here’s where I have a confession to make: even though I haven’t started my application yet, I can’t help occasionally thinking about what I’d do if I didn’t get into the Le Cordon Bleu Patisserie Diploma. Since I first discovered it a few months ago whilst researching culinary schools and programmes, it’s been the only place and the only course that I’ve wanted to apply to. As soon as I read the course description, I knew that it was what I’d been looking for all along; it’s exactly what I want to do and where I want to be. The thought of not being accepted there terrifies me. Because this is what I really want to do with my life; this interest in food and in baking isn’t a passing phase, like so many of my other so-called ‘ambitions’. This is my passion, and, hopefully or so I like to believe, what I’m good at. This is what I want to do for the rest of my life, and I’ve never wanted anything as much as I want this. As such, is it wrong of me to be a little bit afraid that I might not be good enough? Okay, time to stop worrying. Let’s talk about cake. 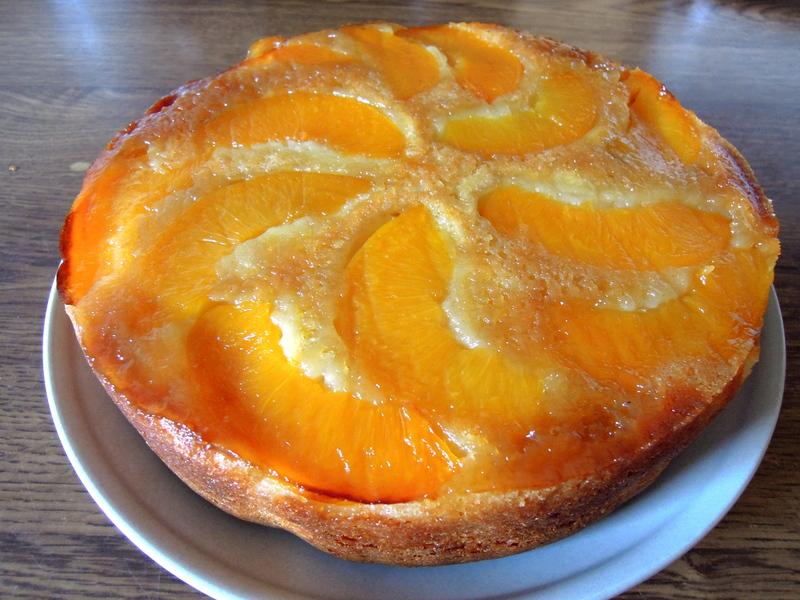 This is Edd Kimber’s peaches & cream upside-down cake. I’ve wanted to make it literally from the first moment that I read his cookbook, and now, six months later, I finally have! This is a truly beautiful cake recipe. It takes sour cream, peaches and brown sugar caramel and bakes into the softest cake you can imagine. It’s sticky with fruit, crunchy with caramelised sugar and has a wonderfully light texture whilst also remaining substantial. (This is particularly important, because I’m not a big fan of sponge cakes which are so delicate and airy that they disappear as soon as you take a bite.) Served warm, it’s the perfect cake for afternoon tea. Or you could have it with a drizzle of cream for dessert. Either way, it’s delicious and is a great take on a classic combination. Firstly, apologies for the long break between posts; it seems like everything is happening RIGHT NOW and I just have a lot on my plate at the moment, hence the slight blog-neglect. Also, this will probably be a more music-centric, rather than food-centric post, so you have been warned! Recently, I’ve taken to listening to Pink Floyd again. It seems that my musical tastes run in cycles and I go through phases of rediscovering music that I love but don’t listen to for inexplicably long periods of time. (To give you an idea of my eclectic tastes, this includes Muse, The Beatles, The Strokes, The Killers, Rachmaninov, Norah Jones, Coldplay, David Bowie, Ingrid Michaelson, Queen, Mahler and the Hairspray soundtrack.) However, sometimes, a rediscovery leads to something more, almost like I am finally realising the potential of my love of a particular artist, composer or group. This is what has happened with me and Pink Floyd in the last week. (A casual re-listen to Shine On You Crazy Diamond (Parts I-V) led to a desire to revisit the entire Wish You Were Here album and things just spiralled out of control from there.) The strange thing is, it’s not like when you discover an artist for the first time; you already know and love this music, but it’s as if all of a sudden, everything just falls into place when you hear their songs. I don’t know how to describe it, other than it just feels right. I was first exposed to Pink Floyd several years ago, in my early teens. (Strangely, my dad felt that it would be appropriate to play The Wall album whilst we decorated the Christmas tree; as a result, I have come to associate Christmas with Pink Floyd. It’s definitely not your usual Christmas soundtrack, that’s for sure.) At the time, they were just another of my dad’s bands, good but nothing special. Then, as my own musical tastes developed, I began to listen to and take a great interest in music from that era, including the likes of The Beatles and Supertramp and of course, Pink Floyd. I longed for the 60s and 70s, an era that seemed so romantic and remote from the times we live in now; the music was better, life was more exciting and it just felt a world away from the decade that I grew up in. I know it’s strange to be nostalgic for a time that I wasn’t alive in, but I’ve always felt like I should have been born thirty years earlier; of course, it’s probably much more romantic to look back at it now than it was actually living in those days. After all, it’s easy to idealise the past…but anyway, now is not the time to go into my opinions on modern society – maybe I’ll leave that for another day! So, Sundays are lazy days – I like to turn off my alarms on Sundays and sleep in. I like getting up later than usual, not worrying about work, having leisurely meals and just having a day off. Sometimes, I like to spend time cooking, and that’s what I did yesterday. I struggle with pancakes. I don’t know why, but more often than not, my attempts result in heavy, doughy slabs of floury, tasteless nothing. I don’t know if it’s the recipes I use or (more likely) my method, but me and pancakes are not friends. (That’s not to say I don’t enjoy eating them – it’s just making them that I find stressful!) 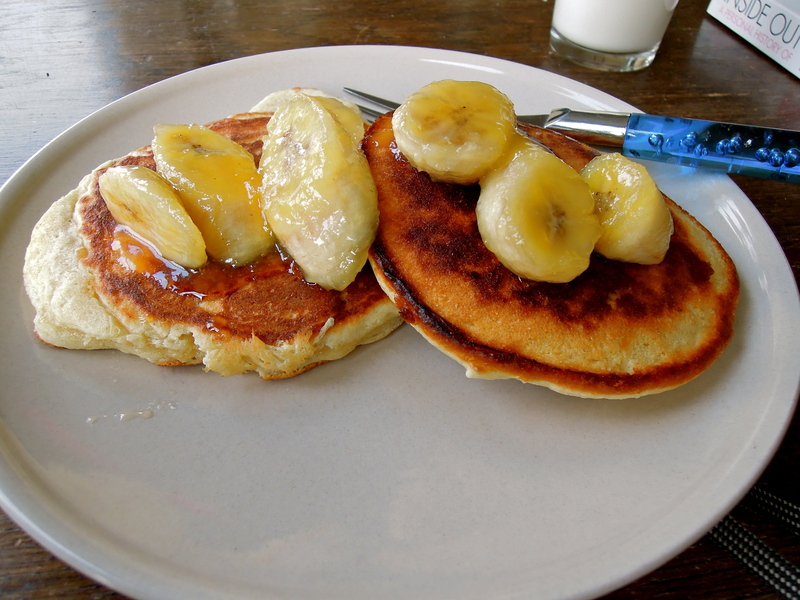 However, seeing a recipe for pancakes on this week’s episode of Nigel Slater’s Simple Cooking, I was inspired to try once more. What’s different about this recipe is that it is much simpler than all the ones I’ve tried previously. Four ingredients mixed in a bowl, no faffing about with baking powder or gradually adding liquid to form a batter – it was literally just a ‘measure your ingredients in this order and mix them together’ approach. Simple. I feel that where I fall down with pancakes is in the actual frying; my impatient nature doesn’t agree with the slow frying over a medium heat method and I inevitably end up burning half the batch. This time, I managed to exercise some restraint and actually turned out a nicely-browned and non-doughy batch of pancakes! It was a sweet success, after so many failures. It sounds strange to say that I have cake-making/decorating/baking inspirations, but I do. They are amazing people who have made their lives and careers by doing what I want to do, incredible bakers who are also creators and innovators and artists. Some of them are what you might call traditional bakers, making conventional cakes and bakes (though often with their own individual twists and takes on the old standards). Others are real experimenters, unconventional in both style and method, pushing the boundaries of baking and cake-making. I like to think that this combination of classic and experimental styles helps me to broaden my techniques and methods; the traditional practices form the foundation of what I can do and the innovative allows me to free my creativity. I draw inspiration from any and everywhere that I can. I’ve started to think in terms of cake. If I see an interesting building or car or scene, the first thought that springs to mind these days is “I wonder how I could recreate that in cake?”. I dream in flavour combinations and piping patterns. I draw out cake designs when I’m bored. I devour food programmes on iPlayer and trawl through websites for new ideas. I’ve even taken to keeping a notebook, my Cake Journal, for jotting down spur-of-the-moment ideas that pop into my head at all hours. The people who inspire me to bake (an assorted array of food bloggers, “celebrity” chefs, professionals etc.) play a very important role in my life; they nurture my ambition as I aspire to be as good as they are, they remind me why I want to bake and why I’m so passionate about it and they also provide me with ideas of my own, fuelling my own creative spirit. Here are just a few of them. Joy, as her name suggests, is a baker and food-blogger. Her blog is funny, smart and beautiful and her recipes are amazing. (Her S’mores Brownies are particularly good.) She’s down-to-earth and real and so very passionate about food and baking, it inspires me to be too. Plus, she loves chocolate and peanut butter and cats. What’s not to like? You may know of Duff and CCC from the Food Network programme, Ace of Cakes. They don’t just make cakes, they quite literally build them. Unconventional is one way of describing their work – power tools feature heavily in the creation of many of their cakes. From the traditional and classic (such as tiered wedding cakes) to the Millenium Falcon, Jeeps (and other cars), pianos, beavers (and other animals), sports stadiums and more, it seems that they will make any and everything. The word “can’t” doesn’t seem to figure in their vocabulary, and they truly do test the limits of baking and cake-decorating. I just find everything they do incredible; the effort and care and detail that goes into every cake they produce is mind-blowing. These are people who really seem to love what they do, and that is what really inspires me. 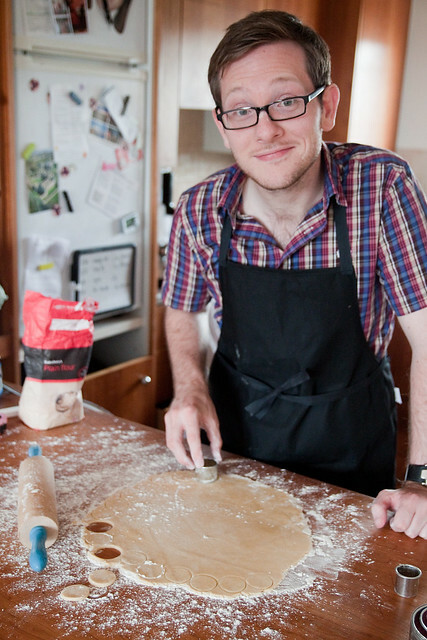 Edd is the 2010 winner of the BBC series The Great British Bake-Off. Since winning, he has written a cookbook and started teaching macaron classes. He inspires me because he began as just another amateur home-baker, but has now made it as a professional. It proves that it can be done, if you have the passion and determination and skill, and it gives me hope to know that others have succeeded before. My ambitions aren’t just pipe dreams any more, but something tangible, real; if I work hard and stick with it, maybe one day, I’ll make it too. Of course, there are many others, but these are my main inspirations – the ones who really show me that it’s possible to realise your dreams and do what you love and love what you do. They are, if you like, my cake-making heroes (that sounds so strange) and they are the ones who, day after day, make me want to keep baking.